The product in this post was purchased by me. All opinions are my own. Save Your Scissors is a lavender crelly with pink, purple, teal, aqua and white glitter, plus a sprinkling of holo dust. I think this polish is a perfect winter/spring transitional shade--it's overwhelmingly cool-toned, but with floral pops of pink! Girly Bits Save Your Scissors. Two coats with Out the Door topcoat. The formula was a bit on the runny side, and I got some pooling in my cuticles, but I had no problem getting even the biggest glitters out. The base color was nicely opaque in two coats. As with most glitter polishes, I had to place some of the glitters on the second coat to get an even distribution. Probably the only real disappointment to me was that the holo dust wasn't as prominent on the nail as it looked in the bottle. As I said, this polish has been discontinued, but right now it's still available for purchase at the Girly Bits shop ($10.33 USD for 15 ml). Get it while you can! Girly Bits is based in Canada, but I found the shipping process affordable and hassle-free. Hi folks! Hope you've been having a great week! Here we've finally been getting some sunny weather and a little bit of snowmelt...I'm really dying for spring to come! So as you can see, I broke a nail this week and had to cut everything down to nubs. I hate the way my nails look when they're this short, but I thought I owed you guys a post. So try to ignore the nubs (and my torn-up skin...I've been shoveling a lot of snow lately). I recently bought my first-ever Rescue Beauty Lounge polishes when they were having a sale. I would never shell out $20 for a bottle of polish, so I was glad to get these for a more reasonable price! This one is Lucciole, a sheer dark blue-grey with strong purple shimmer and gold flecks. Totally gorgeous and magical! Rescue Beauty Lounge Lucciole. Two coats with Out the Door topcoat. What's the most money you'd be willing to spend for a single polish? The product in this post was sent to me for review. All opinions are my own. Hey gang! 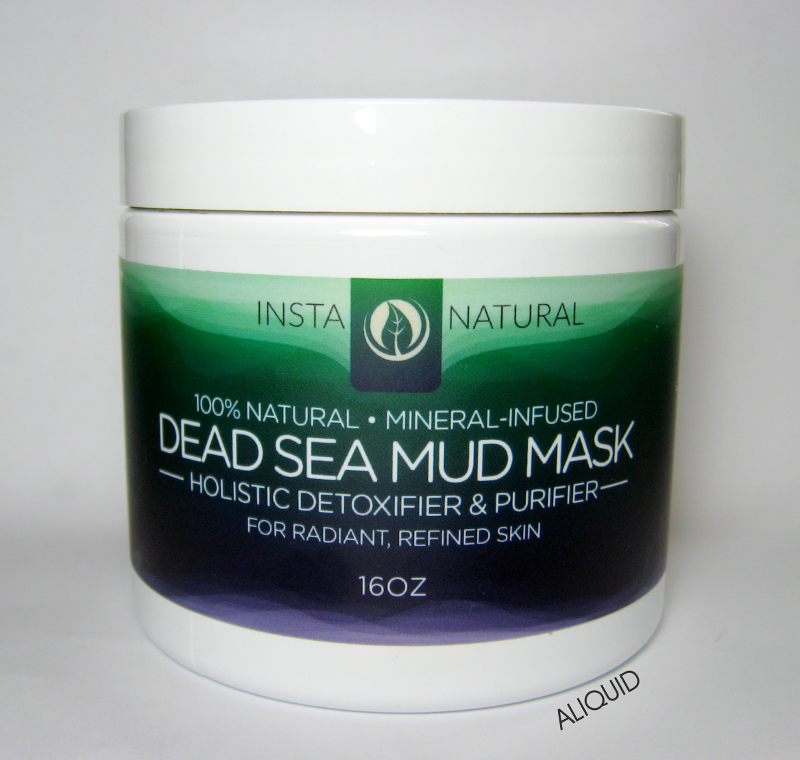 Today I have a review of InstaNatural's Dead Sea Mud Mask. I'd heard good things about products containing Dead Sea mud, especially for treating acne-prone skin. All the minerals in the mud are supposed to be beneficial. So I was eager to try InstaNatural's take on it! This mask claims to absorb oil and dirt from the skin, reduce pimples, and give you a more even complexion. I've only used the mask once (and the jar warns you against using it more than once a week to prevent over-drying), so I can't speak for its long-term effects, but I can give you my first impressions! Part of the reason for this must be the other ingredients in the mask. It's all-natural and contains several butters and oils that are great for facial skin, such as shea butter (my fave), jojoba oil, and calendula oil. It also contains aloe vera and hickory bark extract. I applied the mask all over my face and left it to dry for about ten minutes. I did start to feel some itching as the mask dried. It definitely wasn't some sort of reaction (my skin is not sensitive at all, and I had no redness or irritation afterwards); I think the itching was due to the mask pulling on my skin as it dried. After removing the mask, my skin felt clean and not dry or irritated at all! 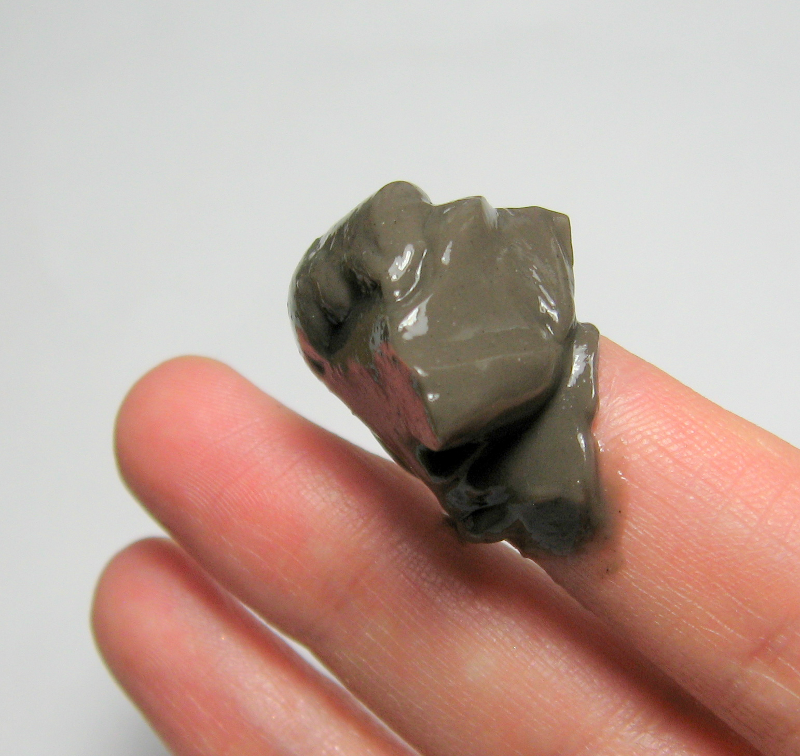 Some masks actually make my face more oily the next day, but I didn't have this problem with the Dead Sea mud mask. I'm definitely going to introduce this mask into my weekly routine! The InstaNatural Dead Sea Mud Mask is available here for just $25.77 for a hefty 16-ounce jar. That seems like a really great deal to me! So today I have a polish that you've probably seen a billion times on the Internet by now, but I was in a Rite-Aid the other day and just couldn't help myself. That's right, it's L'Oreal Masked Affair! This is a silver linear holo with hints of lavender (although the lavender only shows up in certain lights). The holo effect is extremely strong, even indoors! There also seem to be some larger holo particles mixed in, which add texture and visual interest, so it's not just your average silver holo. L'Oreal Masked Affair. Two coats with Out the Door topcoat. After reading several reviews of this polish, I prepared myself for a bad formula, but it actually turned out much nicer than I expected. It applied easily and stayed in place on the nail. (Just use thin coats.) Once the polish dried, I did notice a bit of streakiness, which you can sort of see here, but honestly it didn't really bother me. Overall, I found Masked Affair quite glamorous, and a very impressive effort from a drugstore brand! 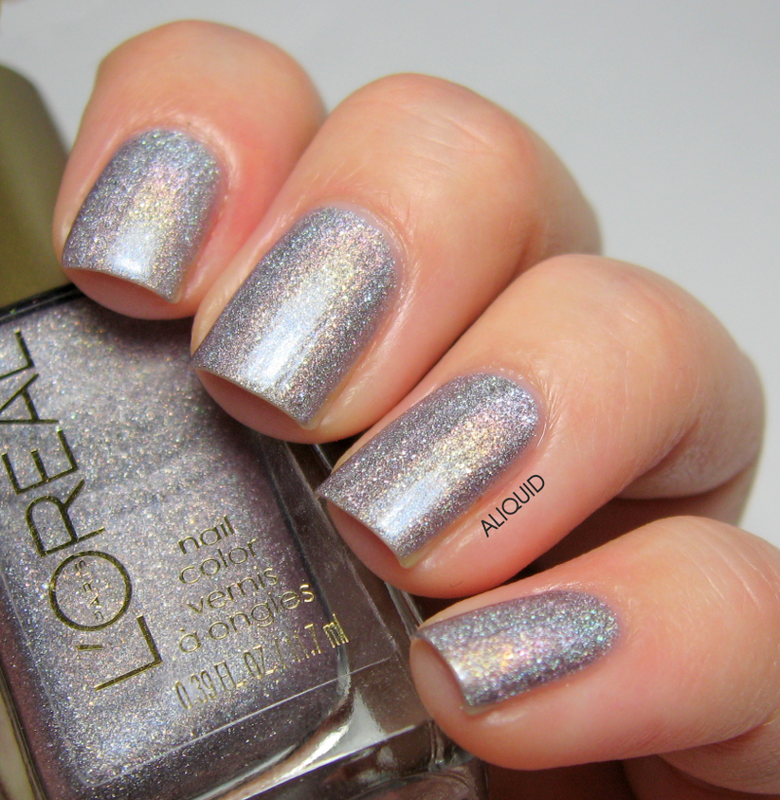 Are you also lusting after this polish? Hi folks! Today we are getting yet another snowstorm. This might be the most snow I've ever seen on the ground at one time. We're running out of room to put it all! Yesterday I decided to fool around with some new Zoyas I got during their last sale. I got three cremes that ended up looking nice together, so I tried out a gradient dotticure with them. The base color is Claire, and the other two are Aubrey and Brigitte. I started by making a triangle shape in dots with Claire at the tip of the nail, and making each row one dot longer than the previous. I made the gradient more gradual by mixing the polishes together to get five colors in total. Once the triangles were done, I filled in the rest of the space using the same colors but starting with the lightest color at the bottom. Then I mattified everything! I think the end result looks pretty cool, although I have to work on getting my dots more even. Happy Friday gang! 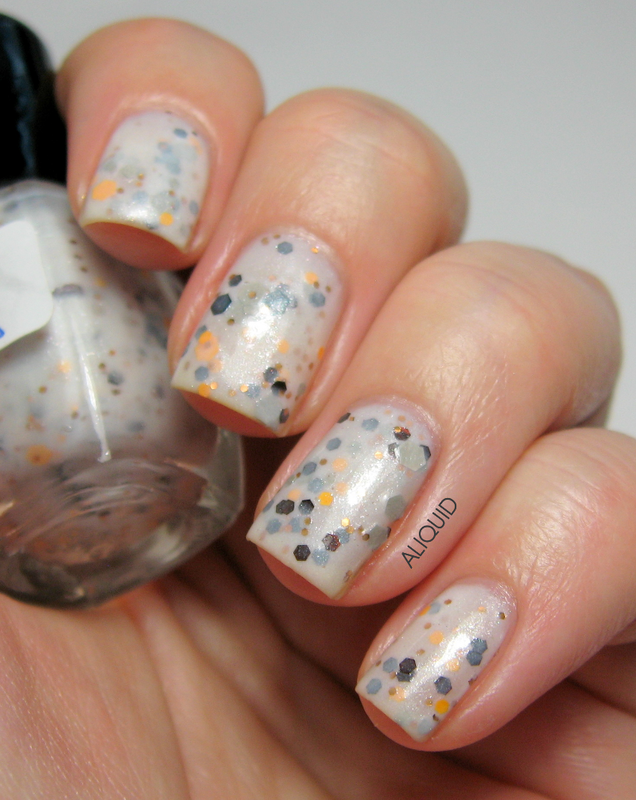 Today I have a polish from a fellow blogger-turned-indie, Leah at FedoraHarp! We first met when we were both doing the 31-Day Challenge back in 2013. Then, when Leah decided to try making polish, I was happy to give her what little advice I could. She very kindly sent me some of her new polishes as a thank-you! What I have today is Fedoraharp Lacquer Whiskers on Kittens. I guess we're both huge Sound of Music fans (Captain von Trapp, mmmm....)! This is a shimmery white crelly with brown, copper, grey and yellow hexes. Leah says it's meant to evoke the colors of a calico cat. So cute!! Fedoraharp Lacquer Whiskers on Kittens. Two coats with Out the Door topcoat. I had no troubles with the formula, not overly thick at all, and the glitters came out with little fuss. With the mini brush, I think the color was juuuuust slightly patchy at two coats, but with a full-size brush I'm sure two coats would be perfect. Fedoraharp Lacquer Whiskers on Kittens. Two coats with Revlon matte topcoat. If you want to support a new indie who has definitely done her research, go check out Fedoraharp's Etsy shop! She's based in Israel but ships internationally (for a very reasonable price)! She charges $10 for 15 mls and $4.50 for 5 mls. Hey, January's finally over! (Unfortunately the bad weather isn't--we're supposed to get another big snowstorm tomorrow.) I'm happy because my application to grad school is all done and submitted, so with any luck I'll be going back to school in the fall to get (another) Master's degree! 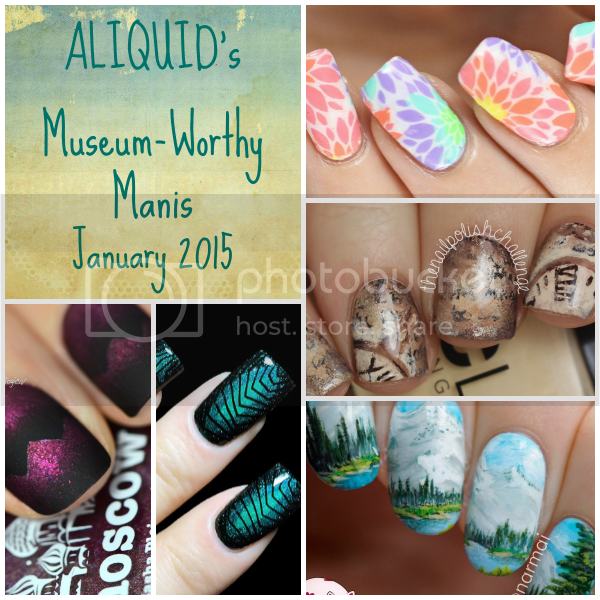 Today, of course, I have my favorite nail art from my Pinterest board from last month. Please go take a look at the original artists' posts and say hi for me! 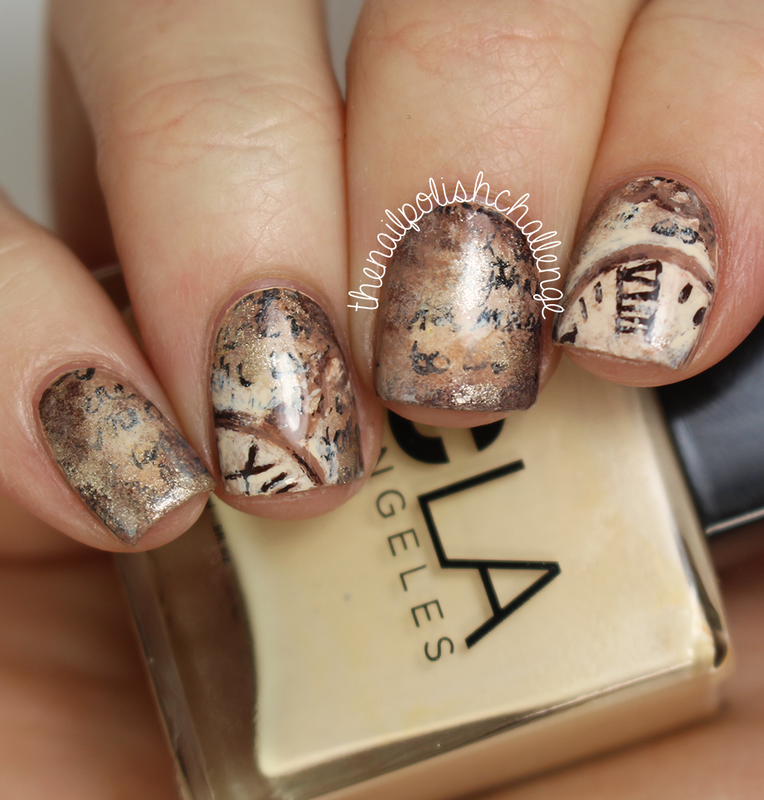 I'm super impressed by this mani because I can never get stamping decals to look this good. I absolutely love the design and the color scheme too--it's making me wish for spring! This is exactly the kind of mani I would do if I had more talent. I love anything that looks ancient (classics major, I can't help it), and she did a great job with that old parchment background! 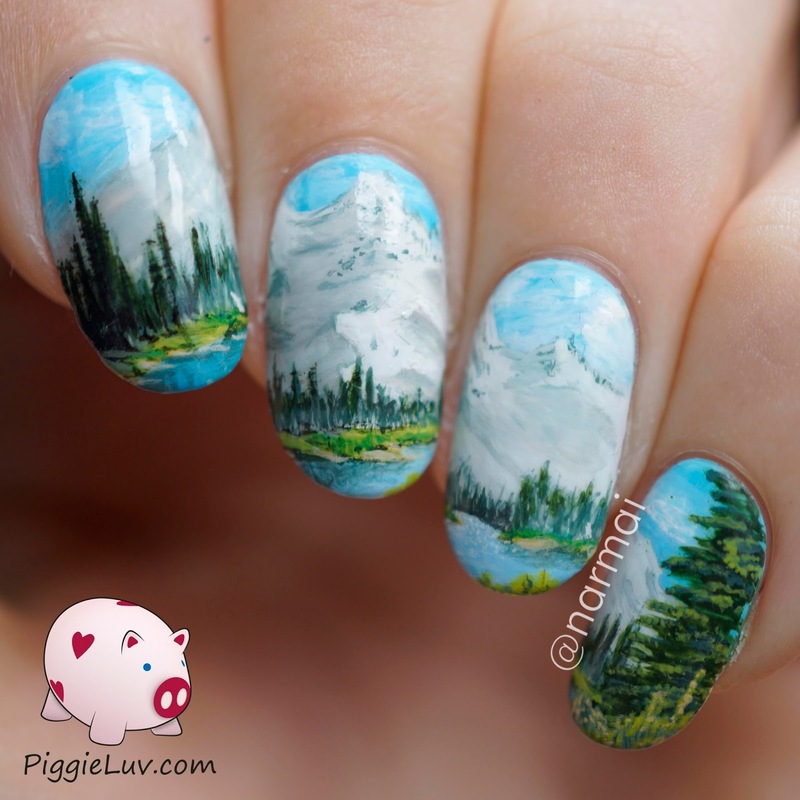 I hope you aren't getting bored of seeing PiggieLuv's landscapes in this feature, because I'm not going to stop picking them! The tree on her pinky finger is my favorite--the detail is just incredible. Normally I don't pick favorites when I make this list, but this mani is probably my favorite this time. I fell in love at first sight! 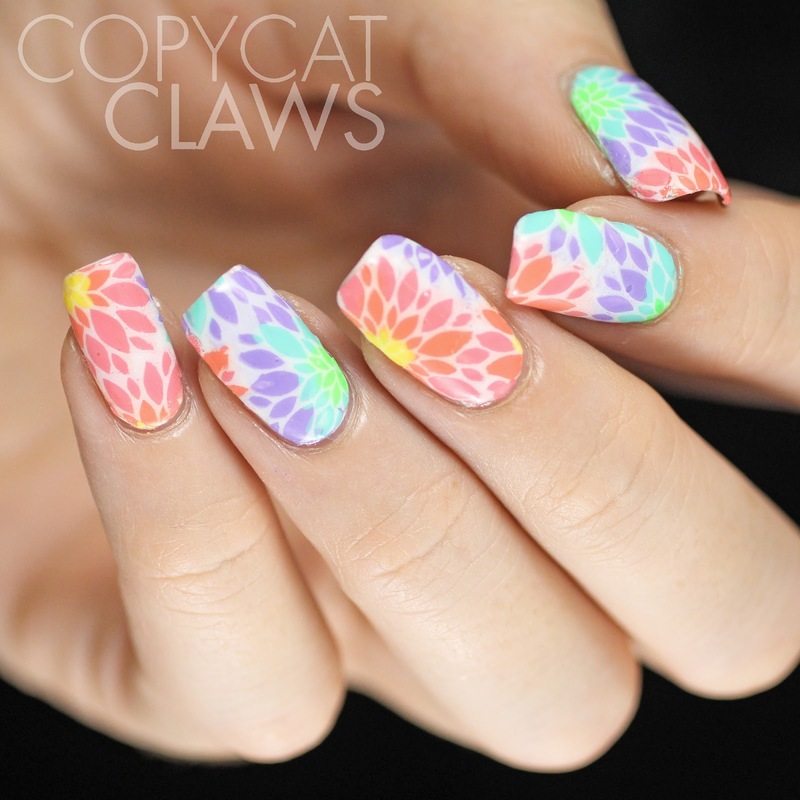 I think it's because of that 3D effect she achieved with the gradient that radiates out from the center of the nail. And speaking of gradients! 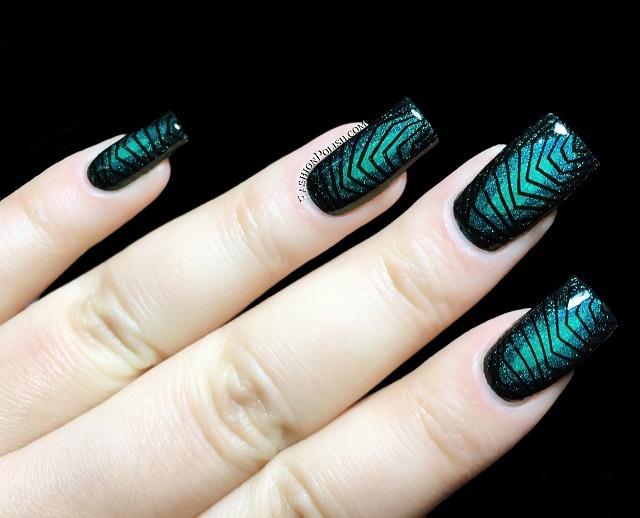 I'm so glad I started following Simply Nailogical, because she does some amazing stuff with gradients. 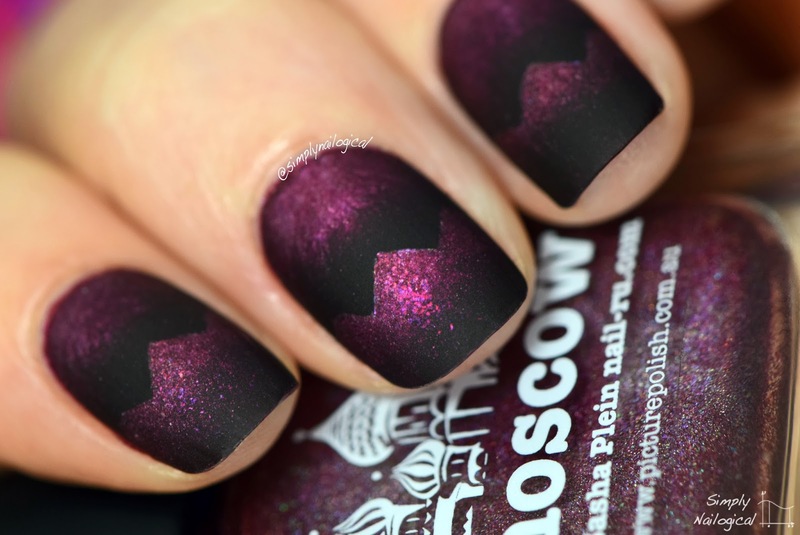 The matte version of this mani just makes me drool.